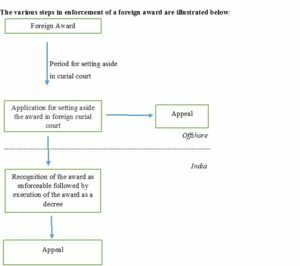 India has long been regarded as an unappealing centre for arbitration – be it as the seat of arbitration or as the place of final enforcement of the arbitral award. Indian judiciary is often quoted to be over interfering in matters of arbitration and enforcement. If fact could replace fiction, in the last decade, Shylock would have a hard time enforcing his rights to his money with little hope of claiming a pound of Antonio’s flesh. The Indian courts wouldn’t shy from reopening and rehashing the proceedings already happened before the Duke of Venice, a twist in the tale that could make Shakespeare rewrite the famous climax and make Portia’s wit of little consequence indeed. While this reputation may have been well-deserved in the decade past, the ground reality since has seen a galactic shift. The legislature and judiciary have together taken upon themselves to ensure this course correction. In this article we bust the myth that is an enforcement defiant India in context of foreign awards. The legislature and judiciary have restricted resistance to enforcement of a foreign award only on established grounds under Section 48 of the Arbitration and Conciliation Act 1996 (“Act”) and, in keeping with the view of arbitrally-progressive jurisdictions, have held that executing courts cannot review the award on merits. Some (the authors included) would even argue that under the present regime, it is easier to enforce a foreign award in India than a domestic one. The introduction of the test of “patent illegality” to the already infamous ground of “public policy”, as interpreted in ONGC v. Saw Pipes (2003) 5 SCC 705, meant that enforcement of a foreign award in India could be challenged on the basis that the foreign award was contrary to the substantive law of India or in contravention of contractual terms etc. – determinations which ought to be in the sole remit of the arbitrator. After almost a decade, the scope of challenge was restricted in Shri Lal Mahal Ltd. v. Progetto Grano SPA (2014) 2 SCC 433 wherein “public policy” under Section 48(2)(b) of the Act was narrowly interpreted and the recourse to the ground of “patent illegality” for challenging enforcement of foreign awards was no longer available. The pro-arbitration shift in the judicial mindset can also be gleaned from the fact that the in judgment Shri Lal Mahal Ltd., the Supreme Court (speaking through Hon’ble Mr. Justice R.M. Lodha) overruled its own ruling in Phulchand Exports Limited v. O.OO. Patriot (2011) 10 SCC 300 (an earlier judgment delivered by Justice Lodha himself – wherein the Supreme Court had ruled that a party could resist enforcement of a foreign award on grounds of “patent illegality”). In a recent appeal, the Supreme Court upheld the finding of the Bombay High Court that in a foreign seated arbitration (and resultant award), an un-signed arbitration agreement would not defeat the award. (See Govind Rubber v Louids Dreyfus Commodities Asia P. Ltd. (2015) 13 SCC 477) The court preferred to give primacy to the intention and conduct of parties for construing arbitration agreements over the mandate of the parties’ signatures required in the agreement. 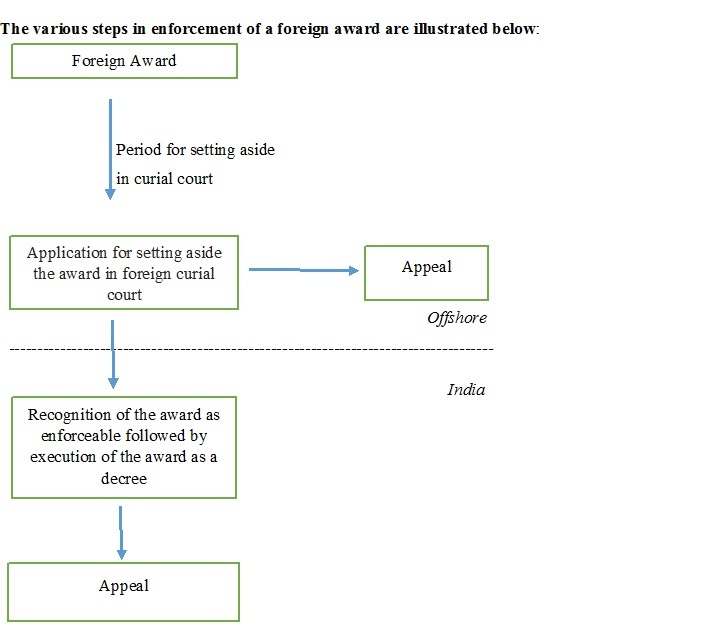 With the Supreme Court taking the lead in a consistent pro-enforcement approach of foreign awards, the High Courts have also been keeping up with the pace, with the High Court of Delhi being the harbinger in this respect. In NTT Docomo Inc. v. TATA Sons Ltd (2017) SCC OnLine Del 8078, the Delhi High Court allowed enforcement of an LCIA award after rejecting the Reserve Bank of India’s objections that the underlying terms of settlement (wherein the Indian entity, Tata Sons, was required to pay $1.17 billion to NTT Docomo, a Japanese company) would be against the public policy of India. The Delhi High Court held that since RBI was not a party to the award, it could not maintain any challenge to its enforcement. 48 countries have been notified by the Central Government of India as “reciprocating countries” under the New York Convention, while only 12 nations have been recognized as reciprocating countries under Section 44A of the Code of Civil Procedure for execution of foreign judgments. In respect of judgments emanating from the remaining countries, the parties seeking execution would have to file a suit in India and place in evidence the underlying foreign judgment. iii. it is in conflict with the most basic notions of morality or justice. The tests for these grounds have been summed by the Supreme Court in Associate Builders v. Delhi Development Authority (2014) (4) ARBLR 307 (SC). It has been further clarified that “the test as to whether there is a contravention with the fundamental policy of Indian law shall not entail a review on the merits of the dispute.” Such amendments are to be seen as strong measures in response to the infamous perception of India being liberal to the challenges to enforcement of arbitral awards on grounds of “public policy”. The Indian legal system continues to face criticism on account of the time taken in disposal of cases. Thus, with the objective to accelerate disposal of high value commercial disputes, Commercial Courts, Commercial Division and Commercial Appellate Division of High Court Act, 2015 (“Commercial Courts Act”) was enacted. Under this regime, specialized commercial courts were set up for speedy and effective dispute resolution of all commercial disputes. Liberalization of policies and clarified norms of doing business in India have made investments more lucrative and attractive. However, to truly sustain its growing global credibility, India needed to deal with the elephant in the room. His Lordship Justice D. Desai in 1982, of the Supreme Court of India had, in relation to the then extant arbitral laws, observed that “the way in which the proceedings under the Act are conducted and without exception challenged in Courts, has made Lawyers laugh and legal philosophers weep” (Guru Nanak Foundation v Rattan Singh (1982) SCR (1) 842). India has since come a long way. In face of the legislative and judicial changes brought in and the evident shift in the judicial mindset, India’s current reputation of being enforcement unfriendly is largely undeserving and a remnant of the decade past – the Bhatia Raj. India is no longer emerging as a pro-arbitration and pro-enforcement jurisdiction. It has already arrived. Sit-up and take notice! California – The Next Major International Arbitration Seat? Escalation Clauses – Where Do They Leave the Counterclaimant?